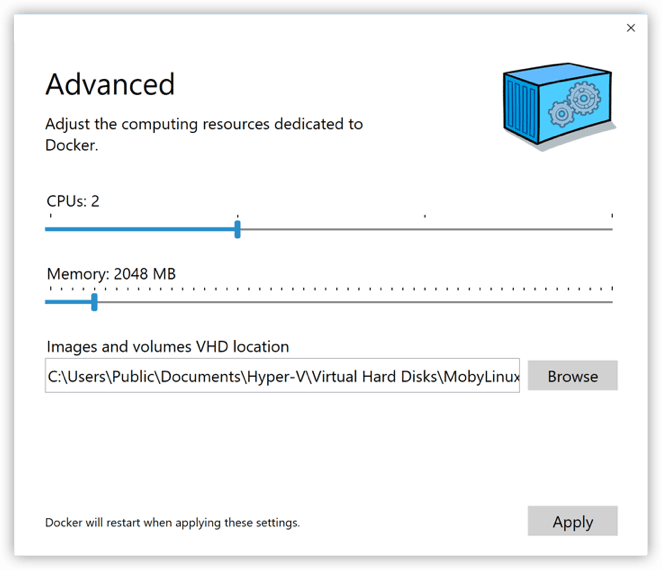 Docker Desktop requires Windows 10 Professional or Enterprise 64-bit. Windows 10 Home edition is not supported. If prompted during installation, do not check the box to use Windows containers. Docker Desktop for Windows can run Windows containers or Linux containers but not both at the same time. QuantRocket uses Linux containers. After the installation, start Docker Desktop if it isn't already started (Start > Docker). Find and right-click the Docker icon in the notification area, then click Settings. Click Advanced and adjust the Memory slider to the desired position. Open PowerShell on Windows (click Start and type "powershell"). If you get an error Mount denied:\nThe source path “\var\run\docker.sock:/var/run/docker.sock”\nis not a valid Windows path, this is due to an issue with Docker version 18 on Windows. You may need to set $Env:COMPOSE_CONVERT_WINDOWS_PATHS=1. See the community forum for more information.